Set out on a 4.5-hour fishing voyage in Pacific waters off Oahu’s coast. Start your early morning adventure from Kewalo Basin, only minutes from most Waikiki hotels. Board a chartered boat and spend a half-day reeling in fish such as mahi-mahi, ono, tuna, and Pacific blue marlin while enjoying Hawaii’s endless sun. At Kewalo Basin Harbor, greet your guides and climb aboard a boat for your deep sea fishing adventure. Meet your captains around 6am at Honolulu’s Kewalo Basin Harbor, located only minutes from most Waikiki hotels. Hop aboard your vessel and head out into the deep Pacific seas off the coast of Oahu in search of fish. Your actual vessel will depend on the size of the fishing group. 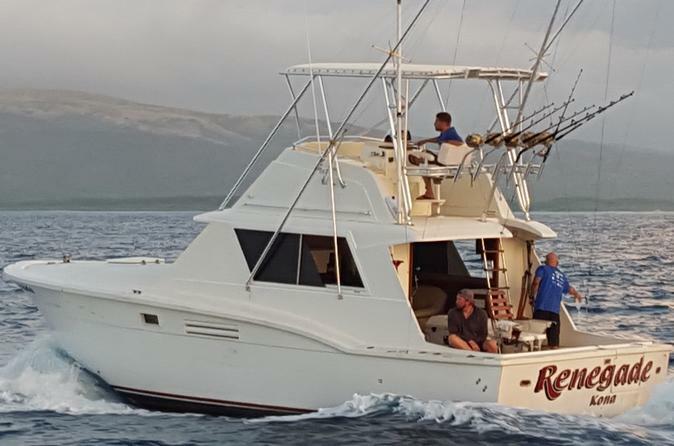 The brothers' Hawaiian Custom Built 39' Force Fishing Machine can take up to 10 people fishing (additional passengers over 6 require an additional fee), while their 38' Hatteras is equipped with Penn International 130 and 80 class rods and reels is reserved for private groups of up to 6 anglers. Cast lines for fish ranging from 5 lbs to more than 500 lbs, including mahi-mahi, ono, tuna, and Pacific blue marlin while savoring the Oahu sun. Let your experienced crew handle all the details. Simply sit back, relax and wait for a fish to bite bait.